We would like to say a big thank you to everyone who made a donation at the end of our Early Years Christmas production, KS1 Christmas Production and our KS2 Carol Concert. We were collecting for Tyler’s Trust which is a local charity that provides gift boxes to children with life threatening illnesses in the Chichester and Worthing areas. They were delighted with the amount we managed to raise and came along to our assembly today to show us where the money goes and what it is spent on. The picture shows what sort of things go into a gift box. 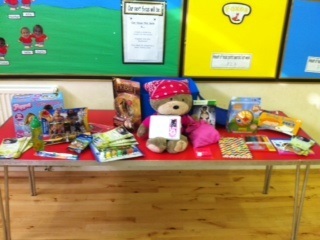 They were able to show the pupils that the £319 that we raised has made a real difference to the lives of young people. Thank you again and if you would like to find out more about Tyler’s Trust please click here to visit their website.